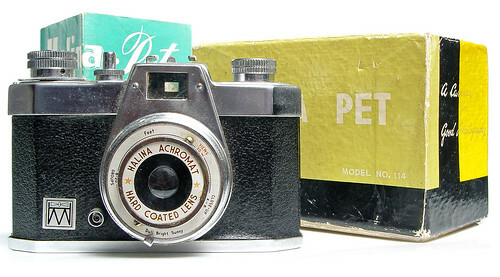 The Halina Pet was my first experience with a real camera. I was 13 and saving up pocket money to be able to afford my first SLR but I was about to leave the UK on a school trip - it would be my first ever trip abroad and I wanted something better than the 110 instamatic I had been using. My Mom went diving through a closet and pulled out her old boxed Halina Pet from her college days. To someone who had been using an instamatic it seemed sophisticated; as advertised it was "an all metal 35mm camera" which was a step up for me both in construction materials and in film format. The controls seemed complicated at first but I quickly got used to them; there were a aperture controlled by a Dull, Bright or Sunny scale; a 1/50th or Bulb shutter speed and a scale focusing lens. Film loading seemed horrendously complicated to someone used to dropping 110 cartridges into his camera but, with a little help from a friendly teacher, I managed to load and use a handful of rolls in my fortnight trip to Europe without losing too many precious frames. Unfortunately the camera leaked light. Not lots of it but the occasional flare or streak here and there but this was in the days before a hip crowd adopted these affects from their Holgas - back then we thought they were just mistakes that ruined otherwise good shots. I was a little disappointed by the Pet's performance even then. I probably put another roll through it before I managed to save up enough for my Zenith but the Pet wasn't a bad introduction to 35mm and cameras that required a little more knowledge than just pushing the button and leaving the rest to Kodak.